1. Will Dashcam Viewer work with my dashcam? The only models I have tested against are listed on the dashcamviewer.com home page. Other models may or may not work. Zip a copy of the entire SD Card folder. You can send me the zip via https://wetransfer.com. My email is john@earthshinesw.com. 2. How do I register the software? You register from within the Dashcam Viewer program. Click here for more info or watch the registration video. 3. Why doesn’t Dashcam Viewer work with the Rexing V1P Pro? Although Dashcam Viewer works with the Rexing V1LG and V1P, the latest firmware of the V1P Pro and V1P (Gen3) was written such that the vehicle’s latitude and longitude waypoints are now encoded in a proprietary format that I haven’t seen before. Two V1P Pro owners have contacted Rexing to request the data encoding scheme, but Rexing has refused to provide assistance. So unless Rexing agrees to provide the encoding scheme or I ‘crack’ the encoding, I’m afraid I won’t be able to support the V1P Pro or Gen3. I suggest contacting Rexing on this issue. There’s power in numbers. 4. After I download the Windows version from your website and run the setup.exe, I get an warning saying “SmartScreen prevented an unrecognized app from starting”. What do I do? On Win8.1 click on More Info to reveal the “Run Anyway” button. Click the Run Anyway button and the install will proceed. There is probably an equivalent override option in Win7 and Win10. 5. Why can’t I see my Map window? Sometimes the windows obscure each other. Try selecting the Map window from the Windows menu of Dashcam Viewer and it should be brought to the forefront. 6. Why doesn’t Dashcam Viewer work with the DOD LS460W or Nextbase 402G? I would love to support the DOD Tech LS460W and the Nextbase 402G! But some dashcam models, like these two, embed their GPS data into the movie file in a proprietary way. Without data format information from the manufacturer, decoding the GPS data is very difficult. I believe both the LS460W and 402G encoded their GPS data using the same method. I’ve tried to contact DOD Tech (info@dod-tec.co) but they never responded. I also reached out to Nextbase (sales@nextbase.co.uk). They responded with a “we’ll get back to you” and that was it. Perhaps if enough DOD Tech or Nextbase customers contact them they would be more forthcoming. 7. I have a Viofo A119. The movies play fine but I don’t see any GPS data in the Map or Graphs. What’s going on? I have heard this complaint from a dozen A119 customers so far. I have examined sample movie files provided to me and have determined that there is no GPS data written into the movie file. Here are hex dumps of the movie file where the GPS data is supposed to be in sample movies produced by two different A119 dashcams. Only the A119 on the right is correctly writing data into the movie file. This A119 is NOT working correctly. It is not embedding GPS data into the movie file. This A119 is working correctly and saving GPS data to the movie file. A number of A119 owners have corrected the problem by downgrading the firmware from 2.01 to 2.0. In one case the vendor (SpyTech) exchanged the customer’s A119 for a new one. Presumably this fixed the problem. If you send me a sample movie I can examine it to see if it has this problem. UPDATE: Viofo notes that it addressed this issue in the firmware v2.02 update. 8. Does Dashcam Viewer work with the DDPai M6+ dashcam? That said, Dashcam Viewer will look for DDPai “gpx” files in the 103gps and 203gps directories. So as long as there are filename-matching gpx files in the 103gps or 203gps folders then the DDPai M6+ is “unofficially supported” in Windows Dashcam Viewer. Unfortunately, the MP4 movie format they use is not compatible with the QuickTime Player 7 library so the movies don’t play in the Mac version of Dashcam Viewer. 9. Why doesn’t Dashcam Viewer work with my Garmin Dash Cam 35, 45, 55, etc…? I’ve had the opportunity to examine Garmin Dashcam movies in a binary file editors as well as a couple of movie player apps. I was not able to locate the GPS tag information in the file. I’m not surprised — Garmin is good at hiding and encoding their GPS data. I’d need help from the Garmin engineers to locate and decode the GPS data. Until then there’s not much I can do. 10. My dashcam’s movies don’t play in the Mac version of Dashcam Viewer. Why? The Mac version of Dashcam Viewer uses the same video backend as QuickTime Player 7 (not Quicktime Player 10). Although the reasons are not clear, a few dashcam manufacturers produce MP4 movies that are not compatible with QuickTime Player 7 (and therefore, not Mac Dashcam Viewer). These dashcams include DDPai M6+, Thinkware F750/F770, and Garmin DC20. Unfortunately, there’s not much I can do I my end to remedy the situation other than switching the video backend (something I’m contemplating). UPDATE: Dashcam Viewer 3 uses a new video backend and should now be compatible with the Thinkware F750/F770. 11. 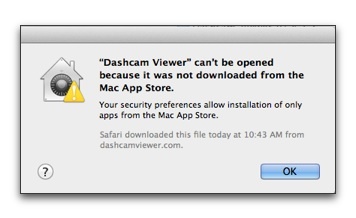 I would like to run Dashcam Viewer on my Mac and PC. Do I need to buy two licenses? Yes, each platform is a separate purchase. Developing and maintaining two “separate but more-or-less equal” versions is actually quite challenging and time-consuming. Mac’s Gatekeeper is blocking DCV from running. You need to temporarily adjust your Security & Privacy settings. 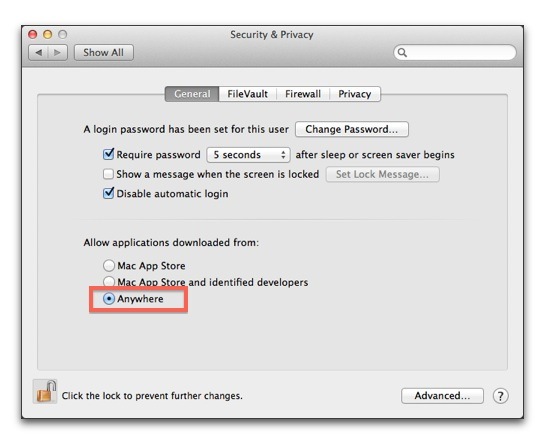 Go to your System Preferences and select Security & Privacy. Then choose “Anywhere” for “Allow applications downloaded from:”. After you run DCV the first time successfully you can switch your Security&Privacy settings back. In newer version of macOS, it’s a lot simpler. After copying Dashcam Viewer to your Applications folder, right-click on the Dashcam Viewer icon and select ‘Open’ in the popup menu. You will then be given the option to run the program even though it’s not from an ‘approved’ developer. Fortunately, you only have to do this once! 13. Dashcam Viewer is hanging on my MacBook Pro with Retina display running Yosemite (OS X 10.10). Any idea why? We have found that the Graphs display on Dashcam Viewer has an issue some Retina Macs. Try this tip from https://support.apple.com/en-us/HT202471. Quit the application if it is currently open. In the Applications folder that opens, click the application’s icon so it is highlighted. Place a checkmark next to “Open in Low Resolution” to enable Low Resolution mode. 14. When I use the “Export Clip” feature I don’t hear audio in the exported clip. This is a rare issue but the customer who had this problem reported that it only occurred if the clip was played in Quicktime Player. The audio was heard correctly if the clip was played in VLC or the clip was uploaded to YouTube. 15. I just downloaded/purchased Dashcam Viewer for my new PowerUCC Panorama-G camera and noticed something odd. All the “extra windows” (map, graph, Data Display Window) are running about 30-seconds AHEAD of the actual video. The problem is that the dashcam’s internal clock is not set to the correct time. This issue was confirmed by comparing the displayed clock time in the movie to the time captured by the GPS. Please make sure the camera’s internal clock is synced to GPS time. 16. Why doesn’t Dashcam Viewer work with the BMW Advanced Car Eye dash cam? Previously I had a chance to investigate the Advanced Car Eye dashcam and it does some tricky things. First of all, it combines both front and rear movie track into a single movie file. I’ve only seen this done with one other dashcam, the VisionDrive 9600. The media library software I use with my software does not allow me to separate both tracks. So for the VD dashcam I actually had to write them a pre-processor program that separates the tracks into two movie files. Very complicated for the user. The second problem is that your GPS data is encoded in a proprietary method within the movie file itself. Many times the GPS data is encoded in the movie subtitle stream, but not in this case. Without help from the manufacturer it is extremely difficult to decode. As a former MINI and 328i owner I would have liked to have made this dashcam work, but I’m afraid it’s got me beat—for now. 17. I have a Panorama X2 with front and rear cameras. How do I view both movies simultaneously in picture-in-picture mode on my Mac? This mode is supported in DCV v1.6.3 and higher. See the FAQ section of the Users Manual for details. 19. I have a Windows PC and got the following error when I ran Dashcam Viewer: The ordinal 4369 could not be located in the dynamic link library LIBEAY32.dll. I found an old system at work that had a lot of miscellaneous software installed on it and 17 copies of LIBEAY32.dll. None of the copies were in the c:\windows\system32 folder but were in various software installation folders. I ran dashcamviewer and received the dll error. I took the LIBEAY32.dll from OpenSSL and placed it in the c:\windows\system32 folder and dashcamviewer ran without an error. On my computer I moved the LIBEAY32.dll from SysWOW64 to System32 and mine now runs without an error. Installing the 32 bit version of OpenSSL correctly places the dll in the correct system folder. From what I have seen and some additional reading on Microsoft TechNet it appears that most programs install the version of LIBEAY32.dll that is used in developing the software in its own folder. So there are multiple copies and because it is not a registered dll, each program uses the version it installed. I tried putting this dll into the dashcamviewer directory and it still gave the error, so it expects to see it in the c:\windows\system32 folder. I have a fair amount of software installed on all of my computers at home and work and none of them have this dll in that folder. I don’t know why only a couple of us have had this problem or what software the other users are installing that puts this file in the system32 folder. But I don’t think you need to change the way you are programming it and include this files since statistically the error rate is inconsequential and the fix is simple. I have never run into this problem before with this library file so just chalk it up to another one of those weird things thanks to Microsoft. 20. I don’t see any GPS data. Why? 1) Are you sure the GPS was ON and had established a lock on the satellites? 2) Are there any error messages displayed? Do you see any data traces in the Graphs window? 3) Make sure your 0803’s internal clock is set to the correct timezone and correct time. DCV relies on the correct timestamp of the movies to sync with the GPS data files. The GPS, your computer, and the dashcam should all have the correct time. 4) If that doesn’t work, send me a clone of your SD card that contains about 3 movies on it and I will try to diagnose the problem. It’s important that you send me an image of the SD card such that the file and folder structure is preserved. The structure should look something like that below. You can send me a zip of the SD card via https://wetransfer.com using my email address as the destination. 21. I am running Windows 7 and Dashcam Viewer shows a black screen when I try to play a movie. Although many people have reported no issues with Windows 7 and Dashcam Viewer, a number of people have reported the ‘black screen’ issue. For that reason I no longer recommend Win7 for use with DV. I suggest a move to Windows 10, which has much fewer issues with DV. If you stick with Win7, you could try reducing the movie resolution to 720p on your dashcam’s settings, which may help, or installing the K-Lite codec pack. 22. How can I import a custom vehicle path (trajectory) if my movie doesn’t contain GPS data? If your GPS data is from a separate source than your video camera (like a Garmin GPS receiver), you can export your GPS data to GPX file (see here for format), name the gpx file with the same base name as your movie but with a .gpx extension. If the gpx file is in the same directory as the movie file, Dashcam Viewer will load it. 23. Is there a version for the iPad? Sorry, no iPad/iPhone version is in the works. With the large movie file sizes recorded by these cameras transferring data to the iPad would be very slow anyway. 24. I have an idea for a new feature. Due to my day-job and limited spare time I cannot guarantee your idea will be implemented promptly (or even at all). But don’t let that dissuade you. Many features currently implemented in DCV were supplied by users like yourself. 25. I think I found a bug. Darn. OK, send it to me via email. When will support for the Rexing V1P Pro be added? Only the GPS mapping isn’t working. It is plotting the location in the Atlantic Ocean. Let me know if you need sample videos. Have there been any advancements on a linux port? I’ve used linux for 10+ years but always needed a vbox from time to time. I would be nice not to have to use it. Hi Glen, I like Linux too but I’m not actively pursuing a Linux port at this time. Supporting Mac and Windows is a time-consuming effort in and of itself. I just want to toss in another vote for this if you ever find the time.. you’re already 95% of the way there given that you’re using Qt and ffmpeg. In the meantime, for anyone else reading, this software does work under Wine; it just looks bad without native theming. Use innoextract to extract the setup file.. “innoextract -e setup.exe”. The just run “wine Dashcam\ Viewer.exe” from the app folder to run it. I’m using wine 4.1 on Solus at the time of writing. Ugly, but works fine. How many days will it take to get serial code for this product…i have waited since monday and im still waiting!!!!!! Johan, your serial code was sent to your mac.com email address on Jan 13th @ 5:45 AM PST (the same day you purchased). Please check your Junk email folder (sometimes the email ends up in there). I will resend just to make sure you get it. I have dashcam azdome Gs63H your software work with this cam ? Dashcams listed on the home page have been tested or reported to work: https://dashcamviewer.com. Others may work, but these are the only ones tested. Hi Frits– we just released it today! Is there a way to flip the rear camera footage to emulate a rear mirror? Even if it takes adding gluten? I’m afraid that even with gluten there is no way to flip the video in Dashcam Viewer, Alejandro. Great software … but I don’t understand how to do one thing. How can I save all of the attributes of my current session? When I press the “Reset Window Positions” option, instead of resetting the defaults to that which are currently on screen, and reflect my desires, I return to the default profile instead. I’d like to be able to create my own default profile, which is loaded when the application starts, and perhaps even when the “Reset Window Positions” option is selected. This results in part because my monitor’s settings are maxed out at 1920x1080px … which contributes perhaps to my discomfort with the current defaults, which while replicable, appear to me to be slightly jumbled/overlapping. With respect to the profile above, I’d like the profile to capture the main viewer screen’s settings for both video streams (SG9663DC here), and restore these after restarting the application. I’ve not yet become a paying customer (I only installed the dashcam yesterday) but I will get a license when I’m using one of my home PCs. With respect to the license, I’ve got multiple Windows PCs that I use at home (all in the same private Class C subnet). I only use one PC at a time, but using a KVM I switch between them constantly. Will a single license suffice for my non-concurrent use on multiple privately owned PCs? Larry, thanks for the feedback. Dashcam Viewer should ‘remember’ your last window positions so they are restored upon restart. Larger screen resolutions tend to work better. You’re right that Reset Window Positions resets the windows to prescribed locations which are not user-configurable. Your suggestion to have the Reset Window Positions function reset to a user-configurable state is a good one, which I can add to the ToDo list. As per the EULA you can install on two PCs. Every time i open up the dash cam viewer, there is a pop to download latest codec. i did install them many times, but it still displaying every time. Does it got anything to do with my initial setup ? Rajesh, you should only need to install it once. After that, just click the “Don’t Show Me This Again” button and the reminder will not display again. I will be releasing a new program called DroneViewer soon. It will be optimized to work with SRT files. Keep checking here. It should be out in a month or so. DroneViewer has been released! Check out http://mydroneviewer.com. Does the Toguard CE30 camera model work properly with this program? I am not familiar with that dashcam model, Robert. If you have one, please see FAQ question #1 for sending me samples files. Leo, if the movies don’t play on your Mac’s Quicktime Viewer, they probably won’t work in Dashcam Viewer. I have an Auto Vox D1 dash cam w/t GPS module. Would this dash cam be supported? I’m not familiar with that model, shanev. Please see FAQ question #1. Hi, I cannot see the gps track on map when google maps is selected (the maps moves when the car moves but there is no track shown on map). Only MapQuest works. Yep, I noticed this too and have been working to understand the issue. As far as I can tell, on or around Feb 14, 2018 Google changed something with their Map service which prevents the Mac version of Dashcam Viewer from drawing anything on top of the map (markers, routes, etc.). Interestingly this only affects the Mac version– the Windows version works nominally. I have a beta version of Mac Dashcam Viewer in progress, which uses a different architecture for accessing the web services, and it also works with Google Maps. So in the future, this won’t be an issue. But for now, please use the Mapquest Map option. Sorry for the inconvenience. HELP! Totally new to this and have no idea what I am doing or per your instructions what I need to do. I own a VANTRUE OnDash X1. Anyway you can helo by walking me through this? Greatly appreciate it. Hi Terrie, I have tutorial movies to help newcomers like you get started. Please see: https://youtu.be/FdQkAfw6aNs for example. Does Dashcamviewer works also with DJI Spark? I haven’t tested the Spark but it should work. Just be sure to enable “video caption” in the Go app.